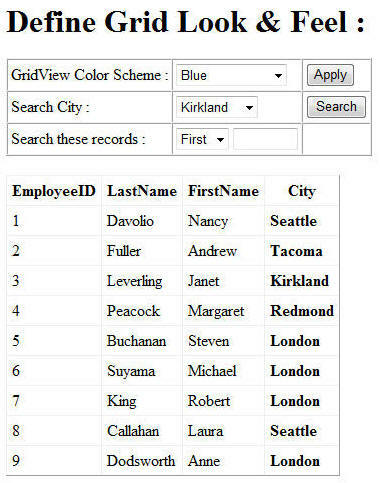 In Part 1 of this series you were introduced with jQuery with a simple example. Now let's move ahead and learn one of the most powerful features of jQuery - Selectors. Let's begin with the basic selectors. Out of the above basic selectors you have already used ID selector in the previous part. So, I will focus more on the remaining ones. The code shown above adds a change event handler for both the DropDownList controls. Notice the use of #<ID> to select a DOM element with a unique ID. The change event handler of DropDownList1 uses the * selector and applies a CSS style to it using css() function. The first parameter to the css() function is the CSS style property to change (font-family in this case) and the second parameter is its value. On the same lines DropDownList2 change event handler sets the font-size for all the elements. If you run the web form and try different values from the DropDownList controls you will find that every element from the web form assumes the new font-family and font-size. The CSS selector allows you to select elements that have certain CSS class or classes attached. 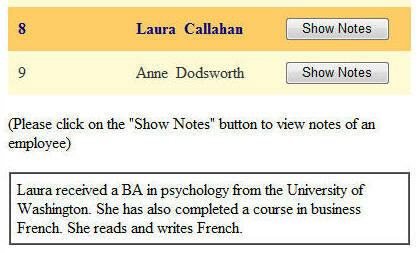 Consider the following example. GridView2 has the other set of classes attached in similar fashion. Look at the code marked in bold letters. It uses CSS selector to select all the HTML elements that have the specified CSS class applied. The CSS class name must be mentioned with . and so we prepend it to the DropDownList value. The code then uses css() function to set new background color and text color as entered in the textboxes. The following figure shows a sample run of the web form. Notice how GridView1 is now being displayed with different coloring. The first line in bold letters uses element selector to fetch all the <td> elements. 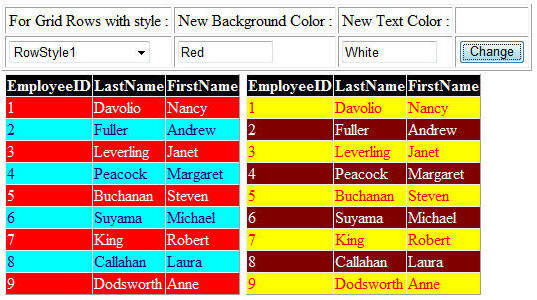 It then sets text-alignment of those table cells to a value as selected in the DropDownList. More interesting part, the hovering effect, is accomplished with the next block of code. Notice the click() event handler of the row. 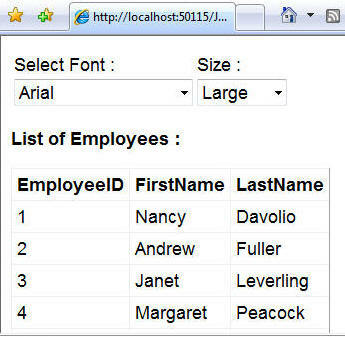 To retrieve the Employee ID it uses element selector again but with a slightly different syntax. 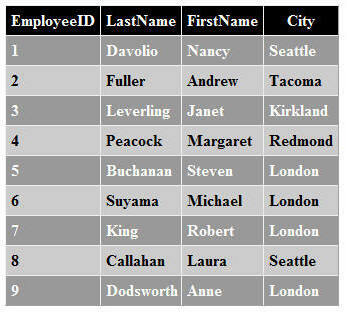 This time it gets only the first <td> element (Employee ID is the first column) from the current row and then retrieves its value using text() function. Now that you have good understanding of basic selectors, let's move on to basic filters. 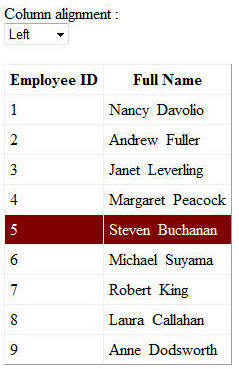 There is a GridView that displays records from Employees table. 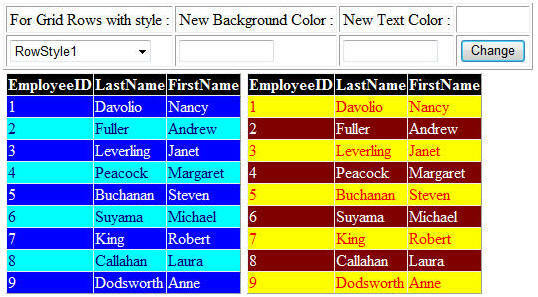 At the top there is a facility to select color scheme to be applied to the GridView. You can select a color scheme and click on the Apply button to see it in action (see below for GridView with Black & White scheme applied). There is also a facility to search the city column. You can search certain records from top or bottom of the grid. The following run shows the results when you look for London city in the last 4 rows. Notice how the matched city entries are marked with red color. Now, let's see the jQuery code that makes this example. The searching functionality makes use of :gt() and :lt() filters and :contains() content filter (more on content filters later). We first check if searching is to be done in top n rows or bottom n rows. In former case we filter all <SPAN> tags for index value less than what is specified in the TextBox3. You might be wondering why we specified <SPAN> tag. 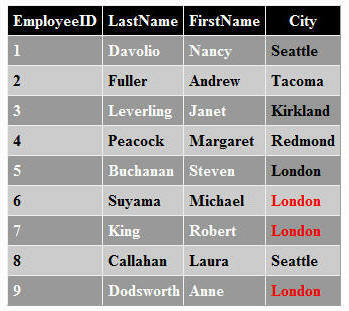 I have made the City column as a template column that displays the city value in Label control. Label control gets rendered as <SPAN> element. If you don't do this then it would have increased your computing logic slightly since there are other GridView columns also render as <td>. Once we get <SPAN> elements less than specified index we search through them using :contains() filter. The :contains() filter take a string criteria and filters all elements from the set that contain the specified criteria. The returned elements (<SPAN> tags in this case) are then applied some CSS coloring using css() function. The total number of <SPAN> elements minus what you specified in the TextBox2 gives you the index to be supplied to :gt() filter. That's it for now. All the examples I discussed above are available in the download of this article. Make sure to adjust jQuery.js file path as per your environment. In the next part of this series I will cover some more selectors. Stay tuned!